The boys from Sheriff have just released their clip for their single “What You Want”. You can check it out below in all its glory. Shot back in September in a shed in Brunswick, it was crazy day with butler service, bumpkins with chickens and the general chaotic ambience that accompanies a Sheriff gig. The clip was made by multimedia designer Lachlan Wright. For the clip I did a quick project creating a mallet to be used as a prop for the clip. 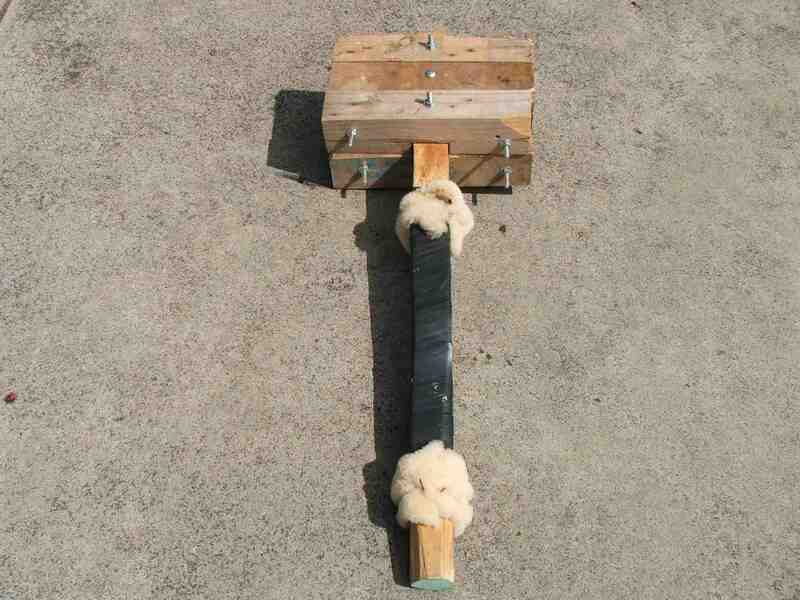 The idea was to create an oversized, primitive styled wooden mallet that would be used by a 1920’s style strongman type. The mallet was made from reclaimed pine posts, with lambskin offcuts used for trimming. The handle was bound with a bicycle inner tube. Check out the clip to see how it went. If you’re yet to see Sheriff and hear their ‘unique blend of Southern-Psychedelic-Horror-Blues-Rock’ you’re in luck. Sheriff has a residency at Revolver all Feb, or you can head to the mountains this coming weekend and check them out at the Cool Summer Festival. ← Strandbeest loose in Melbourne! Nicely done Tim! Awesome clip, and awesome watermelon smashing. Bet that was good fun!